Hi! Welcome to SWIM.AI, where we use Expo™ markers as doorstops and write on the walls. Just kidding. Well, not really. We do write on the walls, but there's more to it than that. My name is Will, and you're reading my last assignment as a summer marketing intern for SWIM.AI. Currently, I am a rising sophomore at the University of North Carolina-Chapel Hill majoring in Peace, War, and Defense. Considering my academic interests, it may seem strange that I spent my summer interning with a software startup, but working at an early stage startup like SWIM.AI proved to be a tremendous and unique experience for me. Hi! 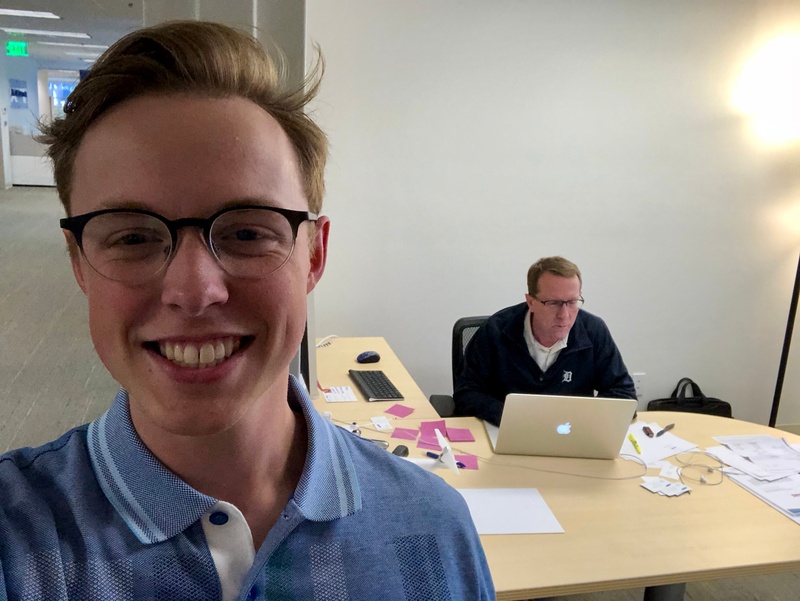 I'm Will, and this is my experience as a summer intern at SWIM.AI. One of the first things that struck me about SWIM.AI is that the culture tends to be pretty relaxed. There aren't strict hours. Employees are free to come and go whenever they want, as long as their work gets done. While most SWIM.AI employees are in before 10 o’clock, a few others keep different hours. This suits many of SWIM.AI's employees, as Bay Area traffic is so atrociously slow and terrible. Anyways, the typical office attire is informal. I could go to work wearing gym shorts and flip-flops (though I have not…yet) and nobody would bat an eyelash. Still, while these policies (or lack thereof) may seem unprofessional to some, every SWIM.AI employee I met exhibited professionalism and took great pride in their work. Secondly, SWIM.AI forced me to try new things and think differently. After this summer, I'm more confident in my own creativity and I feel more intelligent as a result. SWIM.AI taught me that creativity is a process. In the professional world, assignments can be open-ended. I had to think critically about the task at hand, identify organizational goals, and then determine how best to accomplish my objective. Given the unique environment of working for an early-stage startup, I was given a lot of freedom in choosing which direction to take my assignments, which isn't always the case in school. Most importantly, I observed that it was SWIM.AI’s unique community that makes it a fun place to work. The people here come from many countries and backgrounds, creating an environment with a range of different perspectives and ideas. We would still find common obsessions, like Star Wars and Nintendo video games. Some of the most fun times I had at SWIM.AI were spent theorizing about new Star Wars plots, discussing the latest gaming news, and huddling around screens for World Cup matches. But there were also busy times at SWIM.AI, and when it was crunch time, the team buckled down and exhibited a work ethic I've rarely observed in other environments. I grew up playing team sports, so this intense collective focus is something I highly value and respect. Though my career interests lie in foreign affairs and international security, I genuinely enjoyed and learned a lot during my summer internship. At times, when it felt like I had only achieved an abstract understanding of the SWIM.AI platform, the amazing, talented, and kind members of the SWIM.AI team were always available for a patient explanation or to draw a diagram for me. While I'm now more familiar with the technology behind SWIM.AI, and I was able to gain firsthand experience to the challenges of marketing new technologies, I think my greatest enjoyment at SWIM.AI stemmed from the community and the people I got to work alongside. Now, on to the next adventure!